Easter 2008 Mimi’s swing photo – this year including Ryan and Lucy! This week I’ve been putting our family’s Easter plans together. We’ll have lunch at our house on Sunday afternoon, so family members have all been notified about what time to arrive for our traditional Easter spread. The “big cookie cake” has been ordered as well as the Honeybaked ham. The dining room table and buffet have been decorated in bright spring colors and on Saturday Eddie and I will try to clean off the deck from all the pollen and other spring “gifts” the trees are sharing this week! 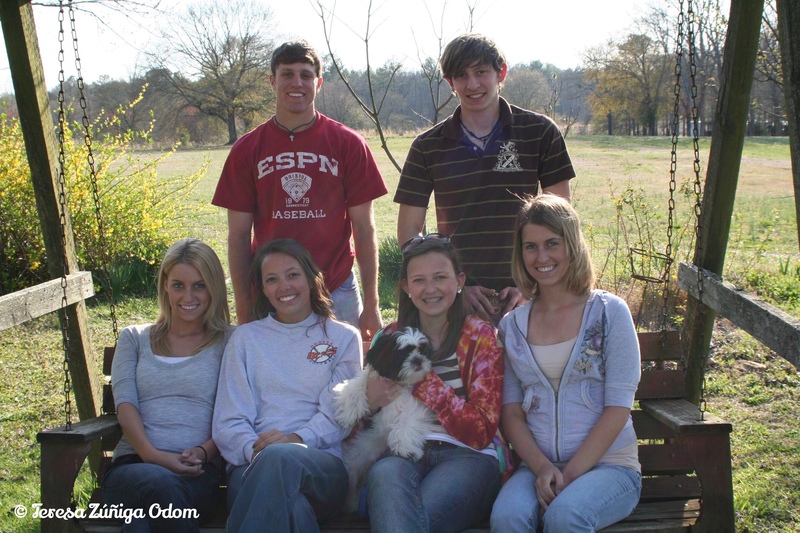 I don’t know what made me look back on photos from past Odom family gatherings. I was thinking about the Easter egg hunts we used to have with all three of my kids in the house. Charlie, Anna Marie and Emily would all start at the top of their stairs with a basket and when Eddie and I would give the signal, they’d come running down to see how many eggs they could find that had been hidden in the house the night before. Every year, we’d find a candy filled egg or two that wasn’t discovered during the hunt a few weeks later. And every year, Emily would be the one who would win with the most found eggs. But for some reason, I opened up the 2008 Easter gallery and as I looked through the photos I was filled with so many emotions. Little did I know what types of stories I was photographing that day only to discover them all these years later. If memory serves me correctly, it was our last Easter at my in-laws home in Jasper. The year before, my father-in-law, Glen Odom, passed away in March. Eddie and his brothers were working on getting their mother, Johnnie, into a newer house with less property to manage. Most of the photos I took that day revolved around a game of touch football in the backyard that the “kids” were playing. They first did this at Thanksgiving a few months earlier and wanted to recreate the fun they had that day. These photographs prove they did just that! Anna Marie throws the ball! My now son-in-law, Ryan, was with us that Easter. I think it was his first time to spend a holiday with us in Jasper and the first time to be included in the traditional Odom grandkids swing photo. My pup, Lucy was also with us that day too! We had just gotten her and at this point she was only about 6 months old and looked like a fuzzy house slipper! She was so fluffy! It was fun to see her in all her fluff and I had honestly forgotten she went with us that year! It was also her first time to meet the family, including Rhonda, my sister-in-law, and her dog, Bentley. Lucy and Bentley would have a love-hate relationship for years to come. Mainly, Bentley hated Lucy to chase him around the house but she did it anyway! Lucy as a pup! She was about 5 or 6 months old in this photo! Emily holding Lucy – she looks so fluffy in this photo! We celebrated two birthdays that day too. My son, Charlie turned 19 and Rhonda’s grandson, Jonathan, turned 12, if I’m counting the candles on his cake correctly! My mother is standing behind Charlie in a few of the photos and she looks so happy. Her hair was finally getting thicker after having lost it due to chemotherapy the year before. Easter 2008 marked one year since she had been diagnosed with breast cancer reminding me how fragile life can be. Charlie with his birthday cookie cake – Mom (Barbara Zuniga) stands behind him. It’s ten years later now and if this trip back through my family photos has taught me anything today, it’s that I need to take even more photos when the family is together. For instance, I regret that I didn’t get a photo of my mother-in-law that Easter. She’s in a couple of photos from a distance but I don’t have anything close up that day. I also wish I had asked my husband to take a few photos of me with both my sisters-in-law that day. Looking back on these photos, I see opportunities that I missed but I also see what I was able to capture too. In the photo of Rhonda holding Lucy, my sister-in-law has her head thrown back and is laughing. I can actually hear her laugh when I see this photo! Ten years isn’t that long ago but in this short time, we’ve lost several family members from these photos…Johnnie, Rhonda, my nephew, Aaron, and just recently, Bentley. Kate and Charlie in the golf cart! These photographs remind me of our family story. They also tell me that our family story will continue. It will have highs and lows, good times and not so good times. Through it all…we will come together each Easter for our own hope and renewal. And we will remember every family member and keep their stories with us. This entry was posted in Holidays, Odom Family, Photography and tagged Canon Photography, Easter 2008, Family Stories, Jasper AL, Odom Family, Photography on March 28, 2018 by Southern Señora.